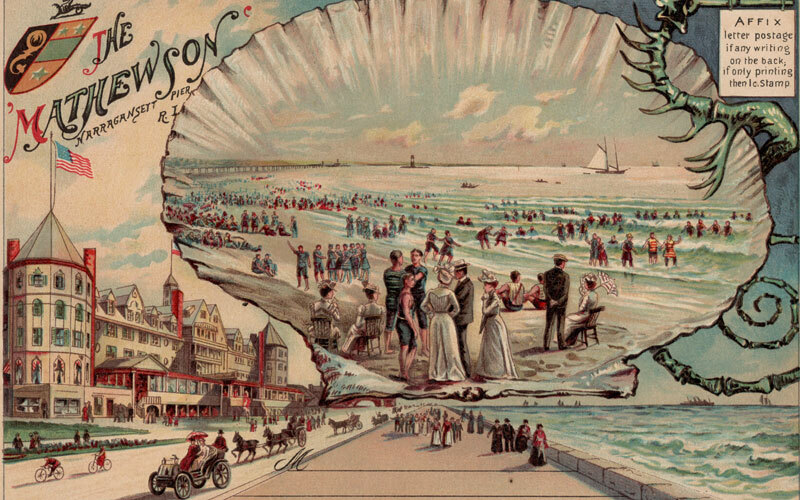 According to a guidebook published in the 1880’s, “The society at the Pier and in the vicinity is select. 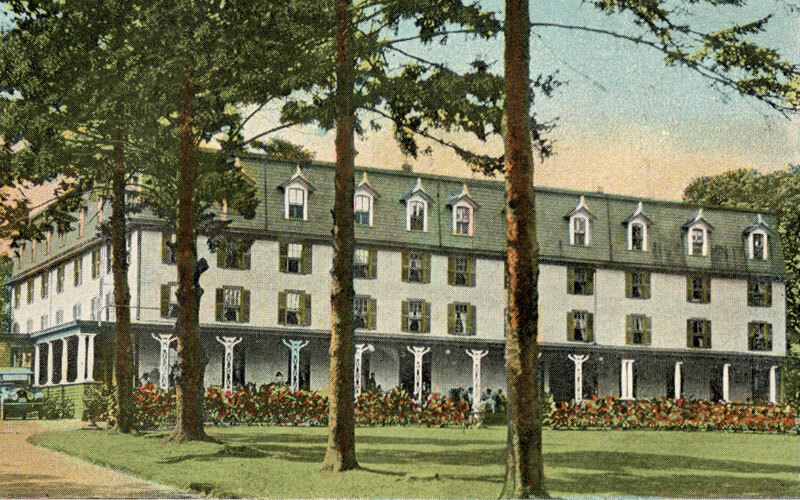 Merchants, manufacturers, statesmen, men of letters and practical science, and eminent professional characters of every sort, choose this as their favorite summer retreat.” While some visitors stayed the entire summer and had their own summer homes, others stayed for shorter periods of time, often staying in hotels. Many hotels underwent numerous changes – changing ownership, being remodeled, and in many cases being moved to a different site, with the name of the hotel often changing once or twice during the processes. The Atlantic House is the only remaining grand hotel along Ocean Road. 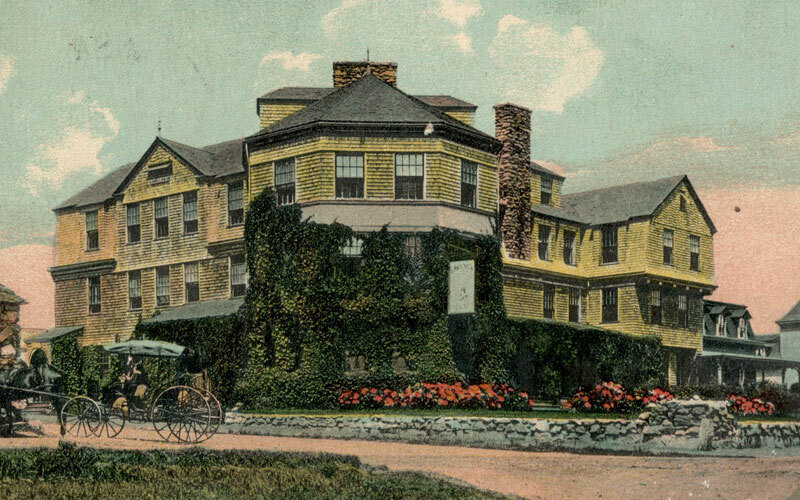 The Bayview was built in 1856 (as The Narragansett House), and operated in two locations, and under numerous names. 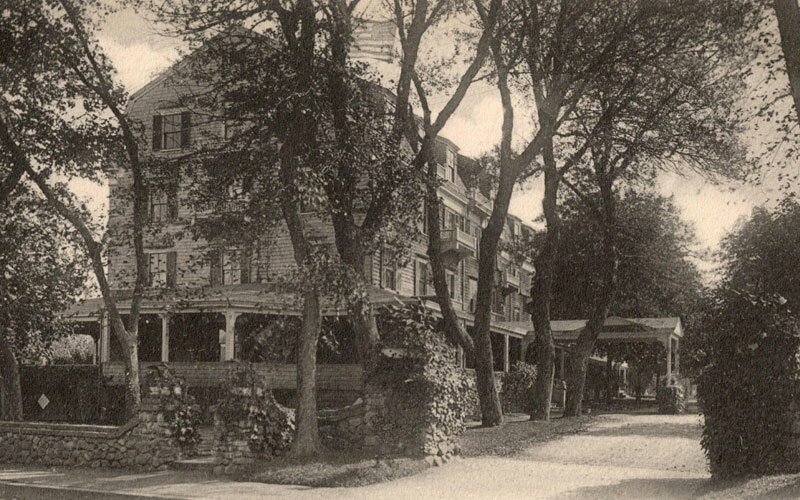 The Beachwood Hotel stood on what is now The Beachwood Apartments (on Kingstown Road, across from Narragansett Public Library). The Berwick Hotel was originally the Mount Hope Hotel, which was constructed in 1871 by William C. Caswell on the corner of Ocean Road and Congdon Street. Originally Kinney Lodge, built by F.S. Kinney, a cigarette manufacturer, c. 1895 as a private home. Chandler’s opened on Congdon Street in 1888, after being moved from Ocean Road, where it was operating as The Narragansett House. Located on Beach Street where The Village Inn currently sits, this unusual brick, stone and iron hotel was constructed in 1890 by William C. Clarke. Built in 1869 by Stephen Armstrong – opened in 1871. This hotel was located on Ocean Road between Congdon and Rodman Streets. It could accommodate nearly 200 guests. The Elmwood Hotel was built by Mr. Jeremiah G. Peckham in 1869. It had between 50 and 75 rooms. The Gladstone Hotel was built in 1887, on Kingstown Road. The hotel was built by combining the Delavan and the Elmwood hotels. Greene’s Inn was constructed c. 1888 on the corner of Ocean and South Pier Roads. The hotel was constructed using English architecture, making it stand apart from the other hotels of the era. 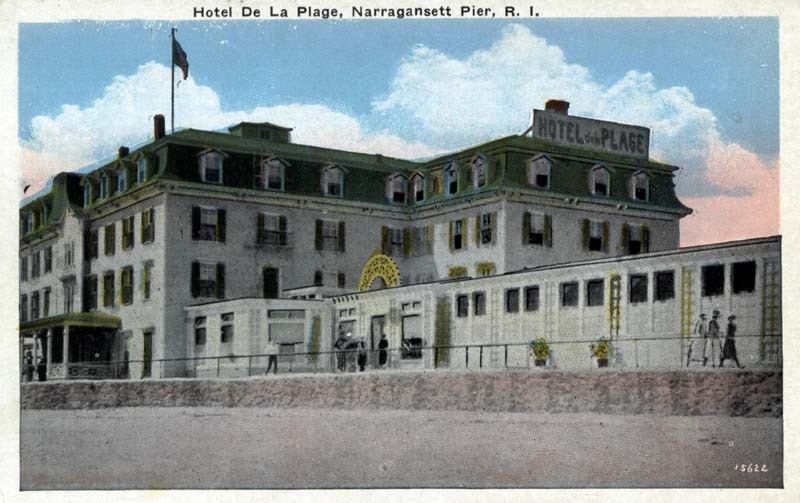 The Imperial Hotel was the newest and most elegant hotel in the Pier. The Mansion House was built around 1866 as an addition to the Watson farmhouse. The Massasoit Hotel, located on Mathewson Street, began operating in 1877 by proprietor John Babcock. 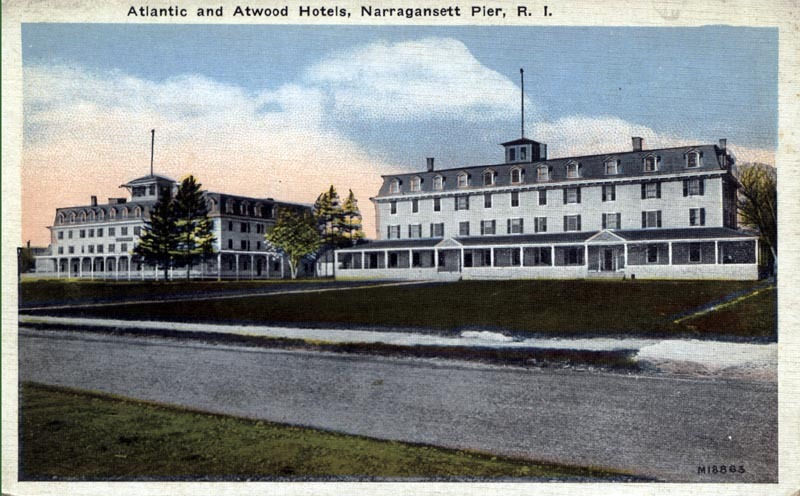 The Mathewson Hotel was constructed c. Built either 1858 or 1868 by S. W. Mathewson on Ocean Road, between the old Narragansett House (Miramar now) and the Atlantic House. The McSparran was built in 1883 on Exchange Place – adjacent to the current post office and was enlarged several times, changing names to become The Rockingham in 1898. The Metatoxet Hotel was built by John H. Caswell in 1866-67. It was a small, family hotel initially, with 29 rooms, but was enlarged over the years to accommodate 250 guests. 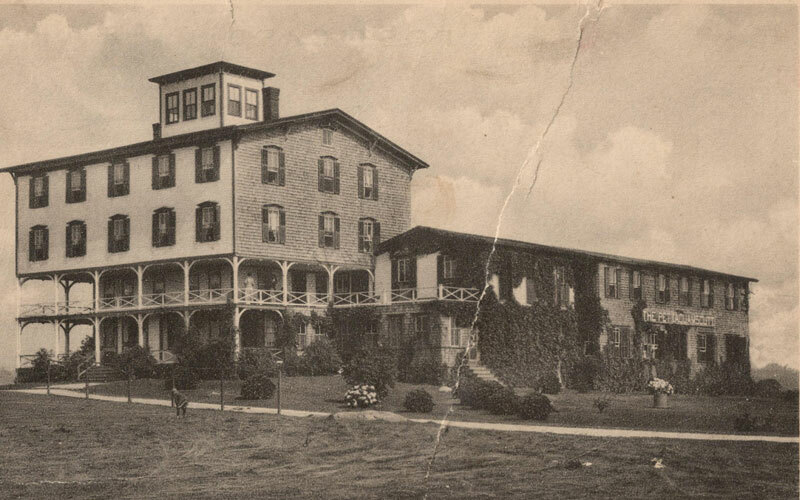 The Mount Hope Hotel was constructed in 1871 by William C. Caswell on the corner of Ocean Road and Congdon Street. The hotel was later expanded to serve up to 300 guests. The Pettaquamscutt House was built in 1885 by Captain George N. Kenyon. Captain Kenyon had managed and owned the Ocean House prior to building the Pettaqumscutt House. The Revere House was built in 1854-1855 by Captain James H. Rodman. It opened for guests in the summer of 1855. Southern Hotel, c. 1880, was a smaller, simpler yet popular hotel located on the corner of Ocean and South Pier Roads. The Arlington was located on Caswell Street between Central Street and Kingstown Road. It began operating as The Arlington around 1895. The Delavan Hotel was built by David Briggs in 1869 -1870 on Kingston Road and Mathewson Street. Around 1910, the European opened, having been purchased by A.R. Edwards and renamed. 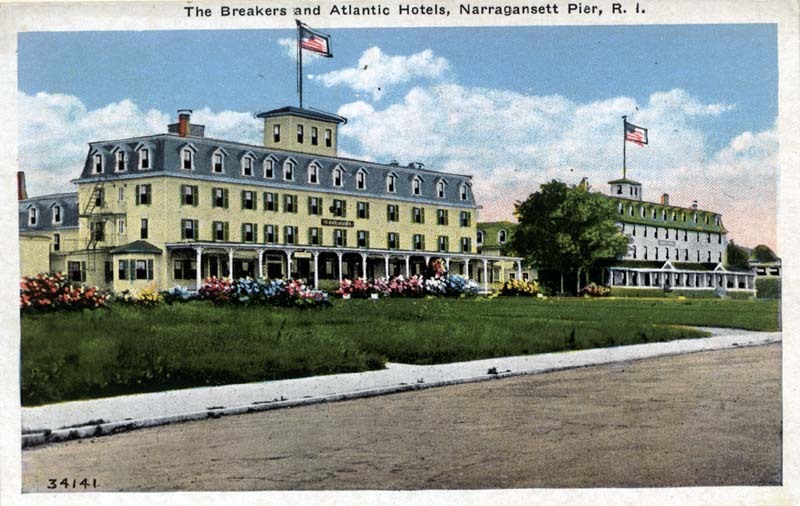 The Narragansett House was the first “hotel” in Narragansett. The Ocean House was built in 1869 – 1870 on Caswell Street between Central Street and Kingstown Road. It was one of the larger hotels, but farther from the ocean than most of the other popular hotels of the day. The Rockingham was built by J. G. Burns on Exchange Place – adjacent to today’s post office. Originally constructed as The McSparran in 1883, it was enlarged several times. The Sea View was built in 1860 by John Eslick. It was located on Kingstown Road, close to where the Narragansett Public Library now stands. Tower Hill House was built about one mile west of Narragansett Beach. It opened in 1871 and could accommodate 250 guests. The Wayside Inn was located on Mathewson Street, opposite the post office and the Casino, facing the ocean.